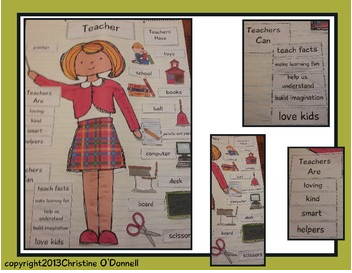 Here is everything you need to create an anchor chart to teach about teachers. This file includes all of the color pieces and labels needed, can, have, are headers, vocabulary words with pictures and descriptive word cards. Please see the pictures! Please take a minute to follow me here and on my blog, your feedback is also appreciated.